In the Western Mass area, the funding for educational programs were cut approximately by 54% in 2016, leaving students with less resources and programs to attend. Funds raised from Bowling for A cause will help us create educational programs giving children the resources, knowledge and tools needed for a bright future. 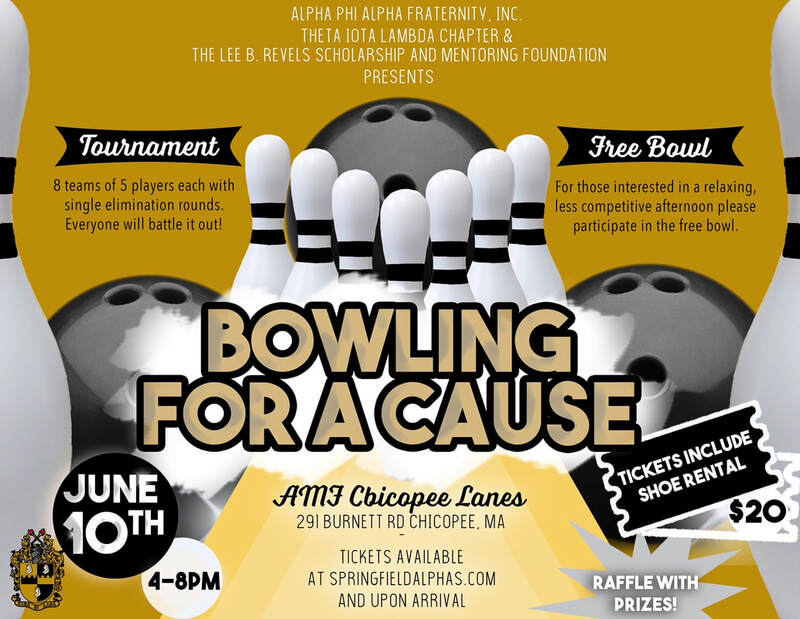 On June 10th join the brothers of The Theta Iota Lambda Chapter of Alpha Phi Alpha Fraternity, Inc. & The Lee B. Revels Scholarship and Mentoring Foundation, as we put on this amazing event for the community. The afternoon will be dual format with the option of participating in tournament style or in free bowl. The tournament portion of the program will consist of 8 teams of 5 players each with single elimination rounds. The top scoring team of the first round will receive a by to the final game. The free bowl will allow for others who are more interested in a relaxing less competitive afternoon. The cost of the ticket will include the cost of shoe rental.